Enchanting and full of the unrestrained joy of a child's imagination, Mary Norton's award winning book The Borrowers ranks among my favorites of childhood. In this lovely 50th Anniversary Edition, Norton explains the process which led her to write the story. When one cannot see panoramas or stars in the vast sea of sky, it is natural to look more closely at the tiny details concealed within the shrubs or along creek beds, or beneath the floorboards hidden among the dust motes. And this was what Norton did as a child. Her splendid imagination created entire worlds...and later, just before war broke out in Europe, her mind returned to these little people of her childhood...and The Borrowers was born. Norton's endearing story centers around the Clocks - a family of tiny people who live beneath the floor of an old English country home. Arrietty, the Clocks only daughter, longs to go with her father on his borrowing escapades in the big house. And one day, he takes her with him. But, the unimaginable and most frightening thing occurs. Arrietty is "seen" by a boy and life for the Clocks is never again quite the same. 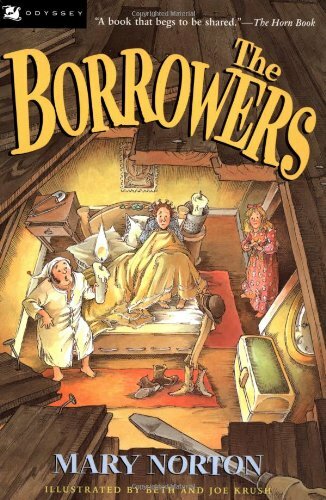 Told in accessible language which draws the reader in, The Borrowers is classic children's literature which will be enjoyed by "kids" of all ages. Norton wrote an entire series of Borrowers books which continue to capture the adventures of the Clock family. As a child, I read them all - over and over again. If you have not experienced the joy of a Norton story, you are missing something wonderful. A fascinating look at a miniature world under the floorboards of an old English manor. The first of a classic series. I can easily believe that little people exist who ‘borrow’ things. How often have you put something down and a moment later it’s gone? And what about all those times when you’ve gone to retrieve something, and you know exactly where you put it, only to find it isn’t there? This happens to me all the time. It's not hard to imagine miniature people living in our houses. It explains so readily where everything disappears! The Borrowers introduces us to Pod, Homily, and Arrietty Clock, so named because they live underneath the grandfather clock in a Victorian English home. They borrow everything they have from the “human beans” that live above them. Borrowing is difficult work and one must be very careful as being seen could be extremely dangerous. What will happen when a little boy not just sees them, but actually becomes friends with the Clock's? Homily loves the new furniture from the dollhouse and life seems to be going well -- until a suspicious housekeeper begins noticing the missing items. I have always been a fan of John Peterson's “Littles” books and this series is a great fit. The idea of a miniature world behind the walls of our house just fascinates me. This is another "children's book" that has fairly adult themes. Everyone in the book has strong and very human emotional motivations. I liked the ambiguous ending a lot - it makes a good self-contained tale. I don't think it needed any sequels. It's interesting that this is a whole genre of fiction - small beings that live at the edges of the human world: Terry Pratchett has visited it with the Truckers/Diggers/Wings series and also with The Carpet People . The Wombles is another example. A more distantly related book is The True Meaning of Crumbfest . A very imaginative and playful story. This book was really fun to read. This is the classic story of the Clock family- Arriety, Pod, and Homily, and their encounter with the boy. The boy brings them treasures, but leads to their discovery and near capture. I have always loved The Borrowers, but finally I have been able to purchase a copy! Not the one as shown in this cover, but the one from Odyssey publishing. It is a beautiful book, and I have two others in the series; The Borrowers Afloat, and The Borrowers Avenged. Kids will love them! "BORROWERS" are very small people living in the human being's house. They borrow many kind of things like ice-cream in the house in a second. So, human being can't see them. Oneday, they were discoverd from a little boy. They talked each others and he (a little boy) talked about the problem in this house. From that, they try to solve it. I think it is easy for me to read fantasy stories than other kind of stories. It is because we can imagine the scene freely. Arrietty Clock and her parents, Pod and Homily, are tiny people who live beneath the floor of an old house and `borrow' the things they need from the humans who live in the house above. At one point, many borrowers lived in the house, but the others emigrated for various reasons and only the Clocks live in the house. While her parents seem happy, Arrietty longs to see the world outside. Her mother finally persuades Pod to take her borrowing and her first time out, she meets the boy upstairs. The boy is as curious about Arrietty as she is about him, and they become friends, with the boy bringing the family all kinds of gifts, furniture, food, jewelry, etc. Unfortunately, the boy takes too much and the housekeeper notices things are missing. Soon the Clocks are forced to flee. This is a terrific book on many levels. It is a book about friendship, different cultures, greediness and fear. The book is so well written that you really do believe the Borrowers exist. After all, who hasn't lost a pencil, safety pins, needles, etc.? This Story by Mary Norton is about tiny people who live among normal sized humans, but are never seen. They "borrow" different things from the humans in order to live. In the story, Arrietty wanders outside the house where she meets the Boy. The two become friends, and he helps her accomplish things she can't do on her own because she is little. This is a great book that demonstrates friendship, and accepting differences. Its also amazing to see how the borrowers use items from the big people's world and adapt them to work in their little world. This is a classic children's novel about little people (Borrowers) who live in the homes of Human Beans (humans) and "borrow" (steal) things from them to live. Arrietty is a 14 year old Borrower who is very adventurous in nature is constantly being to the Human Beans by her curious nature about them. She eventually meets a human boy and they become friends, while he brings her and her family gifts (often furniture from the nursery) while she reads to him. Arrietty is interested in finding out more about the other Borrowers of the world, and sends a letter to her Aunt, via the Boy. The Boy is send back to India where he came from in the end, but is able to rescue the Borrowers from his Aunt before he leaves. This is an old and classic tale, and the first book in a series about the fun little creatures of The Borrowers. I read this book as a child and loved it, and have a younger cousin who is 8 years old and was telling me recently about a wonderful book she was reading (this one). I think it's great how some books can remain popular and loved by their readers after this many years! This book was originally written in 1952, so it has well out-stood the test of time! I read this as a child after seeing the fabulous BBC series with Ian Holm as Pod.I think I read all of them after that - several times though I can't remember much about them any more. It's possibly worth more then 3 stars but because I can't remember them too well they will have to make do. We all borrow. This book about a family of little people that live under to country home that live by borrowing from the family above teaches a lesson in resourcefulness. It tells of 2 families cohabitating yet one unaware of the other. The Borrowers simply use everyday items in place of things that youa dn I and other Big people take for granted. This endearing look at unseen co-inhabitors begins a series. It is clever and unusually believable considering that no, it really isn't true! This is an interesting book that I think I would have liked a lot when I was younger. It ends rather abruptly, so I guess I'll have to read the rest of the series to find out what happens! This is a classic children's novel about a family of tiny people, who live in the home under the floorboards of much bigger people. The little people “borrow" things from them in order to survive. Arrietty, is the teenage daughter of “Borrowers” Pod and Homily. Her parents are very protective of her and do not want her to leave their home. Pod has been “seen” by a human which is the worst thing that could happen. However they may be the only Borrower’s left and Arrietty realizes that she would be the last one if she did not venture out into the world. One day she is finally allowed to go borrow with her father. She immediately encounters a much larger person, a human “bean”, the Boy, and they become friends. He brings her family gifts from the doll house, and she reads to him. Arrietty learns that some relatives have moved out of the house and desperately wants to find out more about them so she sends a letter to her Aunt which the Boy delivers. Eventually the Borrower’s are found out by the lady of the house and chaos ensues. The Boy is able to rescue the Borrowers and is sent back to India where he is from. Arriety and her family move out of the house. Very good story, filled my imagination and kept my curiosity. I would rate this as a Fantasy Fiction story.